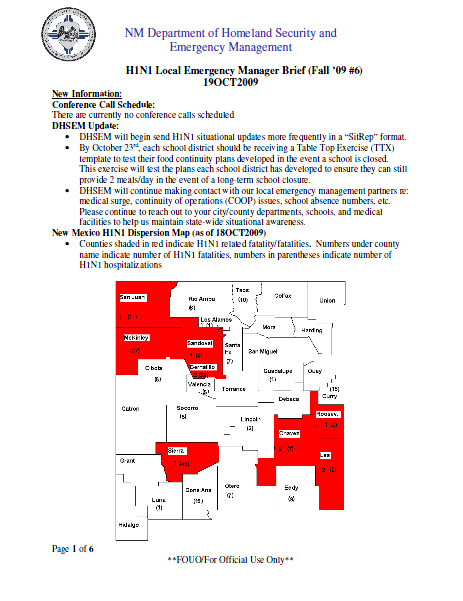 • DHSEM will begin send H1N1 situational updates more frequently in a “SitRep” format. • By October 23rd, each school district should be receiving a Table Top Exercise (TTX) template to test their food continuity plans developed in the event a school is closed. This exercise will test the plans each school district has developed to ensure they can still provide 2 meals/day in the event of a long-term school closure. • DHSEM will continue making contact with our local emergency management partners re: medical surge, continuity of operations (COOP) issues, school absence numbers, etc. Please continue to reach out to your city/county departments, schools, and medical facilities to help us maintain state-wide situational awareness. • There have been 221 hospitalizations related to H1N1 influenza. The hospitalizations by county are as follows: Bernalillo County (39), Chaves County (7), Cibola County (5), Curry County (15), Doña Ana County (15), Eddy County (9), Guadalupe County (1), Lea County (10), Lincoln County (2), Los Alamos County (1), Luna County (1), McKinley County (27), Otero County (7), Rio Arriba County (6), Roosevelt County (4), San Juan County (14), Sandoval County (9), Santa Fe County (7), Sierra County (46), Socorro County (5), Taos County (10), Valencia County (5) and 16 cases where residence has not yet been determined. • As of Oct. 14, the Department of Health has ordered 42,203 doses of novel H1N1 vaccine that will be shipped directly to healthcare providers and public health offices statewide. Both nasal and injectable vaccine has been ordered. The vaccine will arrive in stages, and the Department of Health expects to have about 1.2 million doses by the end of January 2010. 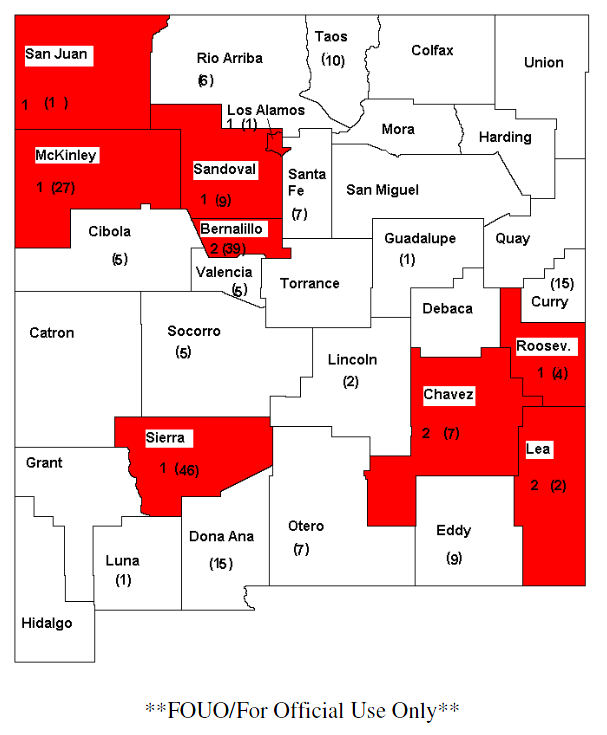 The following is a total amount of novel H1N1 vaccine hat has been ordered for each county as of Oct. 14: Bernalillo (15,680), Catron (40), Chaves (1,410), Cibola (560), Colfax (370), Curry (1,030), DeBaca (20), Doña Ana (4,030), Eddy, (1,140), Grant (650), Guadalupe (120), Harding (0), Hidalgo (40), Lea (1,250), Lincoln (390), Los Alamos (380), Luna (540), McKinley (2,130), Mora (40), Otero (1,320), Quay (160), Rio Arriba (885), Roosevelt (390), San Juan (2,760), San Miguel (570), Sandoval (1,270), Santa Fe (2,765), Sierra (180), Socorro (360), Taos (560), Torrance (200), Union (90), Valencia (900). • People who are experiencing typical, mild symptoms of influenza and are not at higher risk for flu complications should stay home and avoid public places until they are well. Typical, mild symptoms include fever, sore throat, and cough. • People who are experiencing typical, mild symptoms of influenza and are at higher risk for complications should call their healthcare provider or the nurse advice line for consideration for treatment with antiviral medications. • People who develop severe symptoms of influenza should seek care immediately from their healthcare provider or the emergency room. Severe symptoms include shortness of breath, rapid breathing, dehydration, or decreased responsiveness. • During week 40 (October 4-10, 2009), influenza activity increased in the U.S.
• Forty-one states reported geographically widespread influenza activity, Guam and eight states reported regional influenza activity, one state, the District of Columbia, and Puerto Rico reported local influenza activity, and the U.S. Virgin Islands did not report. • All subtyped influenza A viruses being reported to CDC were 2009 influenza A (H1N1) viruses.